One of the original public text archives on the Internet, often copied, never duplicated. The Literature Network is our oldest site, being first conceived in 1999 and then relaunched in early 2000. It currently contains over 1000 full books, over 2000 short stories and poems, and over 8000 quotations. The site receives 2 million readers a month. The Literature Network Forums currently have over 70,000 members. Two sites have been spun off of The Literature Network, the first, Shakespeare's Sonnet-a-Day is home to our 120,000+ subscriber email newsletter. The Literature Network has been a USA Today "Hot Site" among other mentions. 4 Laser Hair Removal was launched in November of 2005. It is an article driven site about laser and intense pulsed light hair removal. It includes a provider directory and a forum. Backyard Gardening is a network of 3 main gardening sites: Backyard Gardening; Backyard Gardening Blog; Backyard Gardening Forums. We hope that this network, launched in 2006, eventually becomes one of the most popular gardening destinations on the Internet. Website Publisher is a portal for website owners and Internet entrepreneurs. It's focus is unique in that it focuses more on the management and running of a successful Internet business, rather than focusing on website development or design. It is a community of people who work for themselves, rather than take on clients. In addition to the nearly 200 unique pages of article content the site features a forum with over 1300 members. 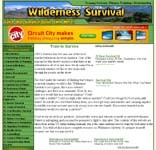 Wilderness Survival is our second oldest site and was launched in May of 2001. Since the fall of 2001 it has been the #1 wilderness survival site on the Internet. It has been mentioned at many media outlets including USA Today, US News & World Report, and Discovery Channel Canada. The site receives 500,000 page views per month. Wilderness Survival is based off of the US Army Survival Manual and has spun off two sister sites, 4 Orienteering and Fitness Training, both also based off US Army manuals. It has also spun off Wildcrafting.net which is a edible plants database/Google Maps mashup. 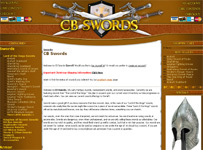 CB Swords is our first ecommerce site. It features swords, armor, and other medieval items, and also movie collectibles. CB Swords was launched in May of 2003 and has had over 5,000 orders and has over 8,000 registered customers who have posted over 300 product reviews. Since launching it has had over 8 million page views. Database of FDA guidelines for common perscription drugs. The main draw of the site is as a resource for actual patients to post questions and seek feedback. Currently patients have posted more than 5000 comments. Mythology - a compendium of myths based on Bulfinch's Mythology. Life of an Artist - galleries and biographies of Renaissance artists based on the work of Giorgio Vasari. Kiss It Make It Better - articles on parenting and child healthcare. 4 Golf Course Reviews - a a directory of reviews on US Golf Courses. Mortgage Sherpa - a mortgage resource site, including a directory with reviews on mortgage brokers. Organic Compost Tumbler - ecommerce site selling earth friendly compost tumblers. Nutriquiz.com - Nutrition based food quizzes and health information. Survive Outdoors - Information on outdoor survival and wilderness medicine. Dividend Calculator - Web based tools for calculating investment return. Wildcrafting - A Google Maps applications and wild edibles database for locating forage sites near you. Child Psychiatry Corner - Articles and forums on child psychiatry for parents of troubled kids. The Food I Cook - cooking blog.